For the story’s first five days, the number of pages given to each day declined, until the fifth day received a single page. Now, the narrative continues to accelerate, instead by covering a longer time period per chapter. The first two chapters covered a single day each (24 and 25 June), and the third covered a week (26 June – 2 July). This fourth chapter covers a period of 20 days (4-23 July). This chapter thus begins two days after the end of the previous one, in which Sophie expressed a desire to create a revolutionary movement focused around the absent-minded Robick. We’re now told that she’s done so, following their ambiguous kiss at the end of the previous chapter. She’s presumably done so with his consent, although with something less than his full intellectual engagement. It’s impossible to imagine him leading a political movement, and we’ll soon see how out of place he is doing so. Given this, it’s likely that he’s given his consent to serve as the figurehead for Sophie’s movement, a name to rally people around. As the chapter begins, Robick’s back in his original office. He still seems cramped, as he works around the network, and the panel underlines this fact by positioning him at the extreme left, allowing the network and the map on his curving office wall occupy most of the panel. But the network has now grown enough that the space within each cube seems to be wider than his desk, allowing for easier mobility around its prongs. The phrase “this time” suggests that Eugen and Thomas have had rows before, which isn’t surprising given their personalities: while one man is defined by intellectual curiosity, the other is more of a political realist, but we’ve already seen both fly into rants, suggesting a shared temperament, if not a shared subject for these passions. It makes sense that this irascibility has produced conflict between them in the past, just as it does that this conflict is irreparable, now that Eugen has (however tepidly and reluctantly) entered politics, formerly Thomas’s domain. From this introductory image of Robick back in his office, we abruptly cut to him being escorted to prison, at 4pm that day (ironically, on 4 July, Independence Day in the United States). It’s not even clear, at first, where the trio of figures is heading, and Robick’s barely identifiable. Only in the second panel does Robick give the time, as he enters the prison building without resistance. 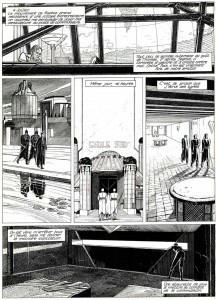 Over the third image, as he’s escorted to his cell, he narrates simply, “It’s from prison that I write these lines.” After these three panels of transit, the page ends with Robick in his cell, looking out of a short but wide window in the cell’s wall at the outside world. He narrates that his escorts arrested him “without giving me the slightest explanation.” He blames this “absurdity” on the High Commission. And just like that, our protagonist is in prison. At first, this might seem overly abrupt, especially the way it’s done, without showing Robick’s arrest. This might even seem like an attempt to deliberately distance the reader, much like previous days have cut off somewhat abruptly, presumably echoing Robick’s journal entries and trusting the reader’s intelligence. But here, this abrupt transition to prison serves another purpose: without Robick ever having to say so, it demonstrates the totalitarian culture of Urbicande. This is the way such arrests happen, in a totalitarian state. Suddenly and without explanation. One minute, a law-abiding citizen can be in his office, at peace, and the next, he can be on his way to prison. And if it can happen to Robick, who’s got popular support and was previously held in high esteem by the city’s elites, it can happen to anyone. The art serves to emphasize this point. The page’s first and last panels are each page-wide panels of the same dimensions, and both show Robick alone. The long shape of the window in Robick’s cell draws additional attention to the shape of these two panels. 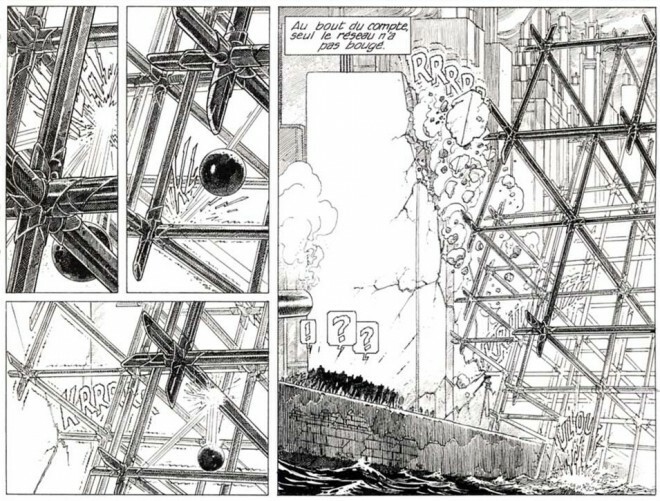 These two panels are separated by a row of three identically-sized panels, ironically making the page reflect Robick’s concern for symmetry. 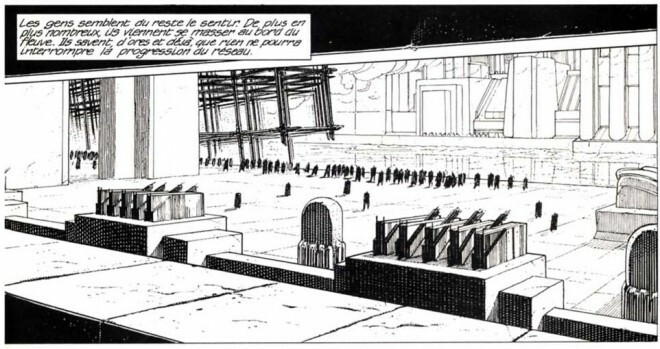 These three taller panels are able to use this vertical space to depict the size of the city and the prison, while the first and last panel emphasize Robick’s isolation. But of course, in the first panel, he’s sitting in his posh, well-lit office. In the final panel, he’s standing in a poorly-lit prison cell. While we’re on the subject of art, Robick’s imprisonment was foreshadowed by his imprisonment (at the beginning of chapter three), when he was shown trapped in the network. From a wider narrative standpoint, his imprisonment flows directly from the end of chapter two, in which Thomas seemed very concerned about how Robick seemed to be taking credit for the network. This is, after all, a story about implications. Despite his sudden imprisonment, it’s astounding how calm Robick seems to be throughout. Perhaps this is only a consequence of his disposition: even being jailed doesn’t make him as emotional as intellectual matters do, such as the city’s lack of symmetry with Bridge Three gone. But we can also see that this is a particularly posh prison. Both the prison hallway and Robick’s cell are sparse but spacious, and one can see what look like ornamental light fixtures on the walls of the hallway and the ceiling of the cell. Yes, Robick’s been cast into prison without being informed of the charges against him, but the accommodations are a far cry from the horrible conditions common to both U.S. and French prisons, including overcrowding. The reason for this is indicated clearly enough in the page’s central panel: the building, which has a pleasant architectural entrance, is labelled “South Jail.” This is the elite jail of the South Bank, and we may only presume that the North Bank’s jails are hardly such a pleasant affair. Even when the elite go to jail, in violation of the most basic civil liberties under a totalitarian regime, they are not equal. There’s a politeness to the South Bank’s justice system, despite its authoritarian injustice. It’s a politeness that indicates privilege — that no matter how far Robick may fall, he’s still one of the elite class. It’s not completely clear why Robick’s been arrested. It may well be Sophie’s fault, since Robick is now identified with the revolutionary movement. But one also shouldn’t ignore that it’s likely a common belief that the network is Robick’s creation, likely for revolutionary ends. Of course, this can’t be proven, and while the revolutionary movement might rally around Robick, he’s essentially done nothing for it. This may account for why Robick isn’t told the charges against him, although this right (known as habeus corpus) may not exist in Urbicande. In any event, it’s clear that the authorities (including perhaps the High Commission seen earlier) have had Robick jailed, legally or not, in an attempt to demoralize the revolutionary movement by removing its figurehead. The next page begins two days later (6 July), as Robick watches the streets through his cell window. He narrates that “Armed soldiers patrol the streets, as if we’re on the verge of war.” The revolutionary fervor at the end of the previous chapter looks poised to explode into violence. After a mere two panels (the shortest day to be depicted yet), the story cuts to the next day (7 July). Still looking out his long window, Robick narrates that “The network now covers the whole of the southeast. Soon, it will establish countless illicit junctions between the two banks. Despite the reinforced police presence, controlling these crossing points will become impossible.” This is, of course, what the authorities have feared all along. It’s why they refused Bridge Three, and it’s a large part of why they’re so concerned about the network. Robick observes that people are increasingly coming “to gather on the riverbank,” which he takes as a response to the fact that the network is unstoppable and will soon breach this division. The revolution has never been so clearly tied to the network before, and it’s amazing how well this sequence ties together disparate hints within the narrative. The true reason for the decision not to build Bridge Three was only implicit in the prologue, and that telling warning about passports, on Bridge One in the first chapter, was pretty subtle stuff. Now, it becomes clearer than ever that Urbicande’s entire social structure depends on divisions, which is exactly what the network eradicates by its very nature. At 7pm that same day, Robick nervously writes that he “had to stop writing” because he “was seized with fright.” On the riverbank, he saw a structure being erected that “somewhat resembled those for a hanging.” From the illustration, one can understand his fear: it shows a wooden structure that does indeed look vaguely like a platform for a hanging. It’s the first time that Robick has shown emotion over his imprisonment or that there’s been any indication that he might be in danger, and it’s not unreasonable to think that this government would stoop to a public hanging as a way of intimidating the assembled crowds in preparation for the network crossing the river. But Robick quickly chastises himself for being so “stupid,” and he points out that “public executions were abolished long ago.” Of course, that doesn’t mean that the government wouldn’t make an exception, under the circumstances. And it’s worth pointing out, to those in the U.S., which still practices capital punishment (albeit not in public), against the trend in post-industrial nations, that even this totalitarian state has apparently abolished the practice. But as we’ve seen with Robick’s arrest, Urbicande (not unlike other totalitarian regimes, such as Nazi Germany) can be extremely polite and concerned with its own, warped rule of law, even in its obvious injustices. “The reality,” Robick narrates, was at once simpler and more bizarre.” The platform he thought was a platform for hanging was merely to elevate a cannonball, which is then slid into an enormous cannon. An military man expresses his certainty that this powerful weapon will destroy the network. It’s a fantastic sequence, but it’s one entirely consistent with the network’s properties, as they’ve already been established. In particular, we know that the network is indestructible, and we also know that, while it passes harmlessly through objects and people, any force applied to it is subject to the normal laws of physics. Thus, pulling on the network while it was embedded in Robick’s desk might well hurt the desk but would not have hurt the network. Here, the same principle is extrapolated onto a grand scale, in proportion with the network’s growth. But it’s possible to read some relief in Robick’s expression as well. After all, while he suspected the result and has written that the network’s growth is unstoppable, there’s no guarantee that its properties will remain consistent as it expands. And his only evidence for the network’s invulnerability are his own limited tests, as well as word that the drill bit excavating the construction site on which it was found broke against it. That might suggest that the cannonball would do no good, once the network had grown so large, but the result was less certain than Robick let on. He might not take credit for the network’s creation, but it’s hard not to see him as taking a certain degree of pride that it passed this crucial test — and a certain glee, given his imprisonment, at the government’s impotence. Of course, that impotence has been demonstrated publicly, which can’t help the state’s attempts to stop the border-crossings that Robick predicts will soon occur. It’s succeeded only in demonstrating its own powerlessness. Moreover, it’s done so in a particularly unimaginative way. While certainly a logical step to take, one could hardly imagine a more literal-minded approach than to fire a really big cannon at the problem. It might appear flippant to claim that this were a perfect expression of the state’s totalitarian mentality, but consider that this mentality expresses itself in monumental architecture, lacking much nuance — and in fact, outright opposed to nuance, if we consider Robick earlier contemplation, in response to the network, of whether minor flaws or discordant elements might not only be tolerated but advantageous. This monumentality represents the state’s power and invulnerability. How appropriate, then, that it would think in terms of a really big gun. Or earlier (in chapter three), the only other step we’ve seen the state take to stop the network: bricking up a wall. Such thinking couldn’t be more opposed to the narrative’s own, which embraces subtlety and implication, rather than directness. The state’s failure also goes back to the idea of cronyism, as best seen in the Academy but implicit long before (if we agree with Robick in his criticism of the High Commission’s decision about Bridge Three). The military man who gives assurances that the cannon will work may even be a member of the Academy. Surely, one cannot imagine Robick taking such a step without making the appropriate calculations, based on tests of force applied to the network. So yes, it’s amusing to see the state failing so utterly that it manages to destroy a building. But that failure, like one of a building, also reveals deeper structural flaws. And these flaws run as deep as the state’s basic thinking. Notably, Robick doesn’t mourn the destruction of the building, which he presumably designed. It’s an indication of how detached he’s become from the city-wide reconstruction effort, which less than a month ago led him to rail against the High Commission’s decision over Bridge Three. And in this unintended demolition, we have a metaphor for how this brave new Urbicande is crumbling. While subtle, this hints that Robick feels something for Sophie, whom he hasn’t mentioned during this entire ordeal. It we accept this, it’s the second time Robick has shown emotion in this chapter — the first being when he was scared for his life. This awakening, subtle though it is, is clearly tied to Sophie, who represents that other, more passionate world Robick found, when he looked through the window of the building adjacent to his and felt embarrassment afterwards, as he met Sophie for the first time. In both that case and this, Robick observes people acting passionately, in one way or another, through a window — as if he, whether by his absent-minded, intellectual nature or force of habit, is somehow cut off from these things. The door to Robick’s cell opens, at first blinding him by the light. Two guards are standing there. One says simply, “Your case has been examined, sir. You are free…” And suddenly, as quickly as he was arrested and taken to prison, he’s now escorted outside, where the light blinds him again and he’s met by the crowd — and before anyone else, by Sophie, who exclaims “Eugen!” and kisses him while the crowd chants his surname. The fact that Robick’s freedom comes suddenly, seemingly as arbitrarily as his arrest, further typifies authoritarian regimes. In such regimes, a prisoner may not know whether a guard is coming to kill him or to free him. Obviously, the claim that his file has been reviewed is nonsense. And while most people and governments have some desire to save face, it’s particularly important to authoritarian states, which can continue to exist, to a large extent, because people believe them to be powerful. Urbicande was thus faced with the choice of either seeming to capitulate to protesters, which might set a bad precedent but could at least appear as a largess, or the worse option of standing firm and being shown to be impotent. Given how politically naive Robick has previously been, it’s noteworthy that he suspects the true reason behind his release. True, it’s tied to the network’s growth, about which Robick’s been quite insightful. And he may not have had much else to think about in prison. But his awareness of political calculations, as opposed to mathematical ones, is largely new. It may also account for why he doesn’t respond more passionately to Sophie’s kiss. Based on his embarrassment over what he saw in the window of Sophie’s building, not to mention his overall repression, he may simply be uncomfortable with returning her kiss in public. But he doesn’t exhibit the same shocked reaction he did shortly before being jailed, and we may well suspect that he thinks Sophie is playing into the crowds by kissing him, establishing herself as “Robick’s girl” for the masses. And this may be true. 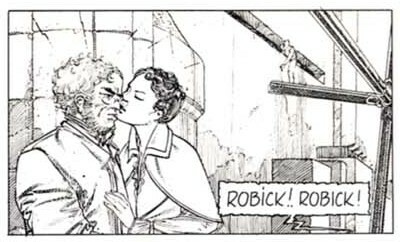 This increased political awareness, on Robick’s part, as well as Sophie’s political skills, is also suggested by what follows: Sophie asks him to “say a few words,” adding “It’s the least you could do for them.” And perhaps to our surprise, knowing Robick, he agrees. He begins, tactfully enough, by thanking the crowd “for what you’ve done for me” — which he knows, at least in terms of what the crowd has accomplished, isn’t much. He continues, “Perhaps you would like me to give you some advice. Alas, I cannot.” He does so after all, but it’s decidedly not rousing words for a movement: “We can do nothing but let things unfold normally. Every outside intervention has aggravated the situation…” He does assure the crowd that “our problems will be resolved,” but he argues that “time […] will provide the solution,” not any action on the movement’s part. He doesn’t mention the network by name, but it’s clear that he’s thinking of its growth and how the city will inevitably respond. He sees the movement as impotent, even self-destructive, more likely to antagonize the current regime than produce change. But he sees the network as all-powerful, and he has become its prophet. It’s not completely clear what Eugen’s relationship is with Sophie, at this point. So much has been kept from readers, presumably indicating that Eugen hasn’t written about such private matters, that we don’t know whether they’ve consummated their relationship or even whether they have a relationship. Sophie kisses him, and he thinks (perhaps correctly) that he can distinguish her voice while in prison. The two are affectionate, and perhaps they’re considering a relationship. But they clearly don’t see one another daily, and the two remain in different realms, with Sophie working on politics while Eugen makes his calculations or dabbles in whatever intellectual curiosity crosses his path that day. It’s hard not to feel that Sophie’s waiting for Eugen to make a move, but that the emotionally repressed and easily distracted Eugen doesn’t have much of a clue what to do. The next page begins a sequence in which the narrative jumps forward several days, with just one large panel per day. The first panel occurs on 11 July, three days after Robick’s release. It offers a brief but momentous note in his journal: “The first elements of the network have reached the North Bank. The military and customs officials are on high alert.” The accompanying artwork does show the network straddling the river, and we recognize that this is the moment the authorities have been fearing — and the real revolution, as Robick has suggested in discounting the movement supporting him. Thus, the panel flows perfectly from what’s come before. It’s a lovely image, and it succeeds because it conveys the network’s geometric precision, at play among the skyscrapers, emphasizing the nature of this phenomenon that has intruded upon Urbicande’s ordered existence. One is obliged to point out, however, that like many depictions of the network in the story, it isn’t entirely consistent with what’s been seen previously. Because the network grows symmetrically, its highest, center cube should be over Robick’s building, yet here it seems to be over the very edge of the South Bank. It’s a significant failing in a story that’s centered around extrapolating from the network’s basic principles. Fortunately, this is a story about ideas as well as lovely drawings, and those ideas resonate despite such flaws. And of course, we know from Robick that flaws like these may somehow underline the majesty of the whole: while I wouldn’t recommend them, they remind us that this story and these images were crafted by imperfect human beings, which only enhances the glory they’ve achieved here. The next panel occurs on 13 July, two additional days later. Now, Robick writes that, “Despite the increased security, some inhabitants of the other bank have attempted to cross the river.” The phrase “the other bank” clearly indicates the poorer North Bank and indicates that, despite his arrest and more revolutionary mentality, Robick still identifies with the South Bank. The accompanying image shows guards with floodlights, shining them like prison wardens on a pair of citizens trying to cross the network. Robick writes that the High Commission has ordered anyone trying to cross illegally is to be “shot on sight.” But those making the crossing must also face “the narrow and slippery surfaces of the network.” Both nature and society oppose these people, and the fact that they continue to make the crossing at all surely indicates the abject state of the North Bank. It’s a situation that recalls East Berlin, occupied (like all of East Germany) by the Soviets after after World War II. The stories of those trying to flee East Berlin into the West, through tunnels and by deceiving security checkpoints, have become legendary. Except there, the two halves of the city, later divided by the famous Berlin Wall, had two different governments. Here, Urbicande has only one, and that makes this divided city all the more horrific. The next panel occurs on 16 July, three more days later. It concludes the page, which thus covers an entire week — a rapid acceleration from anything seen previously. 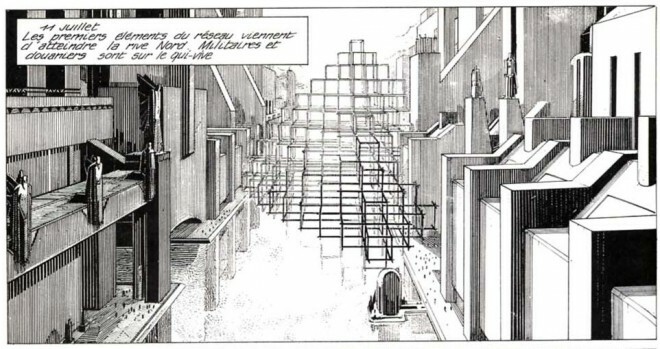 Schuiten and Peeters wisely skip 14 July, which is Bastille Day in France (the equivalent of Independence Day in the U.S.). The day celebrates the 1789 storming of the Bastille, a fortress-like prison — an event celebrated as the symbol of the uprising that formed the modern nation of France. Given that Robick was just imprisoned, with a mob demanding his release, using 14 July within the narrative would have drawn too-obvious parallels: that a fictional world would happen to mirror the history of France would surely be quite a coincidence. But that’s not to say that such parallels don’t exist, on a subtextual level, and they emphasize the sense in which Urbicande seems poised for revolution. Instead, the panel depicts the southern end of either Bridge One or Bridge Two, a scene familiar to readers from chapter one. It’s even shown from roughly the same angle. Except now, instead of during the day, we see the scene at night with the network towering overhead, representing crossings that, unlike the bridge, can’t be adequately policed. Robick’s suggestion that the network would on its own complete the revolution appears to have been correct. The government may be able to defeat protests, but the network is more like a force of nature. And the defections in the military, faced with an impossible (and ugly) task, is key: in most states throughout history, nothing is more key to a change in regime than the loss of the military. The Fever of Urbicande nevers give a definitive point at which the current regime essentially collapses, still technically retaining its power but having no control over its population. But this is effectively that point. We can guess that a nervous tension remains in the air, for days afterward. But never again will we see soldiers in the street, nor the sort of restrictions on movement that we’ve seen previously. The thoroughly unimaginative attempt to destroy the network by canon fire, while Robick was in prison, turns out to have been the existing regime’s last, blusterous gasp. And instead of a violent moment of revolution, the methods through which the state maintained control simply collapse under their own weight — or rather, under the network’s.